I’ve dropped every iron I’ve ever owned – occasionally taking out sheetrock and once gouging a newly refinished wood floor. When I dropped needed to replace my (kind of expensive) iron, I was set on getting a budget-friendly iron because…well, you know, I’m an ironing disaster, clearly in need of an ironing solution. As a sewist and quilter I desire an iron that gets really hot and produces massive amounts of steam. It shouldn’t leak or spit water, and it needs to be heavy enough to sit firmly on the end of an ironing board. Something tells me budget-friendly irons will somewhat disappoint in these two areas. I thought about getting a steam generator iron. After all, they’re heavy enough to not drop off my ironing board. The only problem is most steam generator irons require a little maintenance, don’t have automatic shut off and, as a bona fide ironing disaster, I may or may not remember to turn the iron off. Plus, a steam generator iron requires more space which I’m not willing to part with at this time. 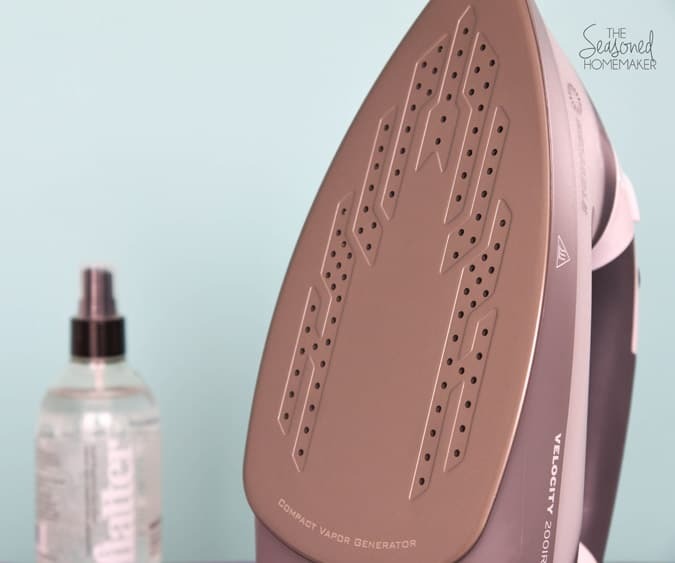 This iron combines the best of a steam generating iron with a regular iron. How does the Velocity 200IR do this? It has two heating elements. One that heats the soleplate and a separate tank that pre-heats the water. That means the pre-heated water is turned to steam before it hits the soleplate. For us regular folks that means the iron doesn’t drip, dribble, or spit water. Ever! The steam functions on this unit are pretty impressive. There are two settings: Medium Steam and High Steam. 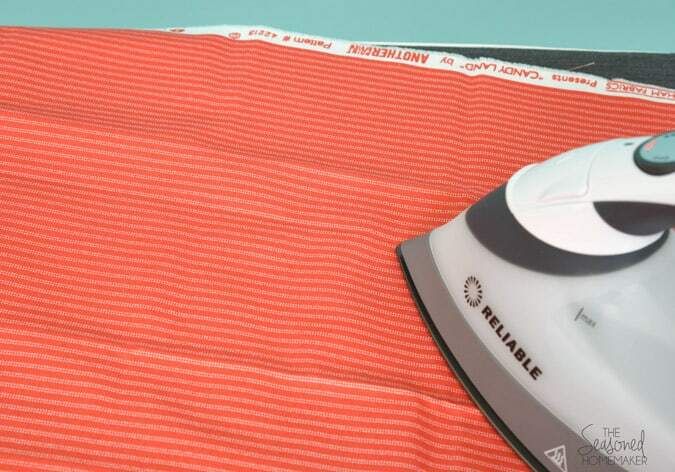 For regular garment ironing and most sewing projects Medium Steam is the best option. High Steam does some serious work. It will take hard creases out of fat quarters and does a great job at fusing things like interfacing. High Steam also works as a garment steamer when you need to remove wrinkles but don’t want to touch the fabric with an iron. Fat quarter with creases BEFORE using maximum heat and high steam. A few seconds later and no creases AFTER using maximum heat and high steam. The steam functions are amazing. Lots of steam. No drips or dribbles. The anodized aluminum soleplate effortlessly glides over fabric and hardly needs cleaning. It has a huge water chamber (1.25 Cups) with a wide opening and a handy water jug with a clever spout. No unnecessary spilling when you refill the iron. It has an auto-shutoff AND the ability to bypass the auto-shutoff. Hold the steam button for 8 seconds and the auto-shutoff is bypassed. The Touch Sensor Handle quickly wakes up the iron from auto-shutoff. 18oo watts means your iron gets super hot and stays hot because it has two heating elements. One for the soleplate and one for steam. Disclosure: I received the Velocity 200IR in exchange for a blog review. I have the freedom to express both positive and negative thoughts about this product. I just couldn’t find anything negative to say. When Reliable approached me about reviewing this iron, I mentioned that I’ve been known to drop an iron or two. The representative assured me that there was a solution to my dilemma. It wasn’t the iron or the iron-er (that’s me! ); it was the ironing board. The Reliable Corporation makes these super-sized ironing boards that are much wider that a standard sized board (such as one you’d find at a discount store) and seemed like a good option for my clumsy ways. True story. Until recently I’ve only owned one ironing board. It was a wedding shower gift 40 years ago. It was sturdy and durable, but not very big. Since I’ve been using the same ironing board for 40 years I felt like I could splurge on a new one and possibly eliminate my clumsy ways. Many of you are likely thinking I need to take my old ironing board and convert it into one specifically for quilts. In an ideal world, yes! But, I only have space for one ironing board which means I don’t have enough area for a second ironing board dedicated to quilting. Reliable has a solution and that’s what I purchased. The Reliable 300LB 2-in-1 Ironing Board with Extension (affiliate) has the stability of the 200IB, but easily converts from a regular shaped ironing board into a very large, very stable rectangular ironing board that’s perfect for ironing quilting projects. I’ve even been able to iron the full width of my fabric on the ironing table. I’m sure it could handle tablecloths and sheets, too (but I’m not ironing these anytime soon). 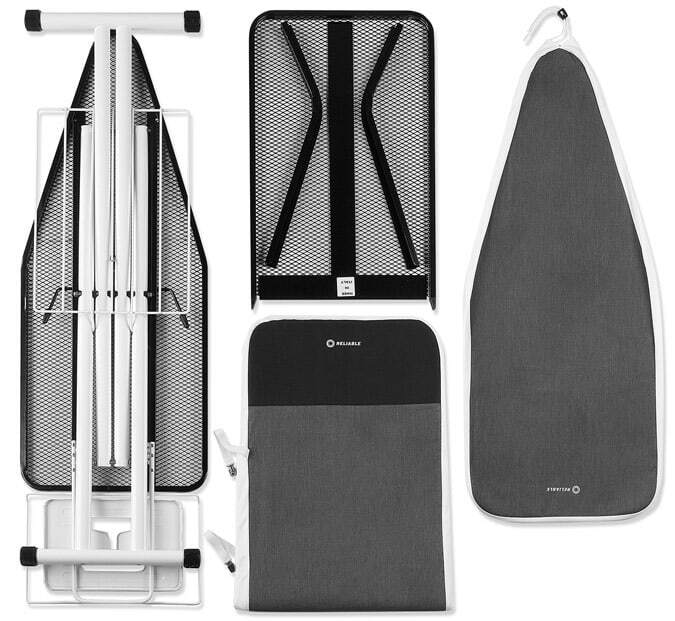 The entire unit comes assembled as a regular ironing board and includes a beautiful ironing board cover. However, in about two minutes it converts into this amazing ironing table. Even better, the set includes the ironing board cover for the large rectangle. And, notice how the end of the cover is black. It’s a heat resistant fabric so you don’t have to worry about burning the cover. This image shows the extension piece that slips over the narrow end of the ironing board, forming a rectangle. I found it to be simple to install/remove and it didn’t affect the sturdiness of the ironing surface. While the ironing board was a significant investment, overall, I am thrilled with my new ironing set up. For me, this combination offers the perfect solution to my needs. I have an awesome iron that gets the job done and the convertible ironing-board-to-ironing table is the best solution for my sewing and ironing space. And, my iron rests nicely in the support tray so I think my iron-dropping-ways may have come to an end. Loved my velocity and recently upgraded my iron to the g reliable 300is for my garment and tailoring needs. Absolutely love it!!! My Shark Pro just quit working. Up until that, it was wonderful, though it ran out of water faster than I would have liked. Lots of steam though. This is awesome! My iron recently met with a similar fate and I was frantically searching for a new iron. I settled for an iron that was on sale, knowing that it was only a matter of time, but I needed something NOW. Thanks for doing all the research for me! Hopefully I’ll be getting this in the next few weeks! Oh, oh,oh….I do SO wish this setup was available in Australia! I have been looking at a steam generation iron, but can’t justify the cost. And by the time I get around to making an extension board for my (still perfectly fine) ironing board, they’ll be carting me out in a box!! Am in total agreement with Mary!!! Love it !! I too drop my iron, went though many of them. 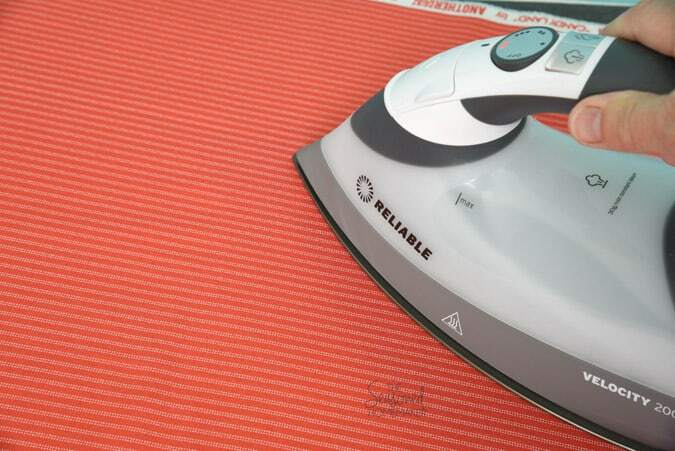 My iron board is not stable when ironing large pieces of fabric. I will have to see who sells them in my area. May I ask where you bought yours. Click on the Amazon link and one will quickly be on its way. I want to try this iron ! I love that ironing board, it is awesome! Wow! If I did pinterest of facebook I’d definitely share this post. I was cracking up reading it, especially imagining you answering your iron! That was hilarious. I once threw away my dirty clothes and the trash is just below the laundry chute. Good thing I came to my senses before I threw them out! I’ll have to investigate this iron and board. I have an ironrite that I do large pieces of fabric and everthing else, but it’s in my basement and I sew upstairs. Thanks for such an informative post. Always LOVE your fun and very informative posts. Wow! Would love, love, love this setup. A real thing of beauty! 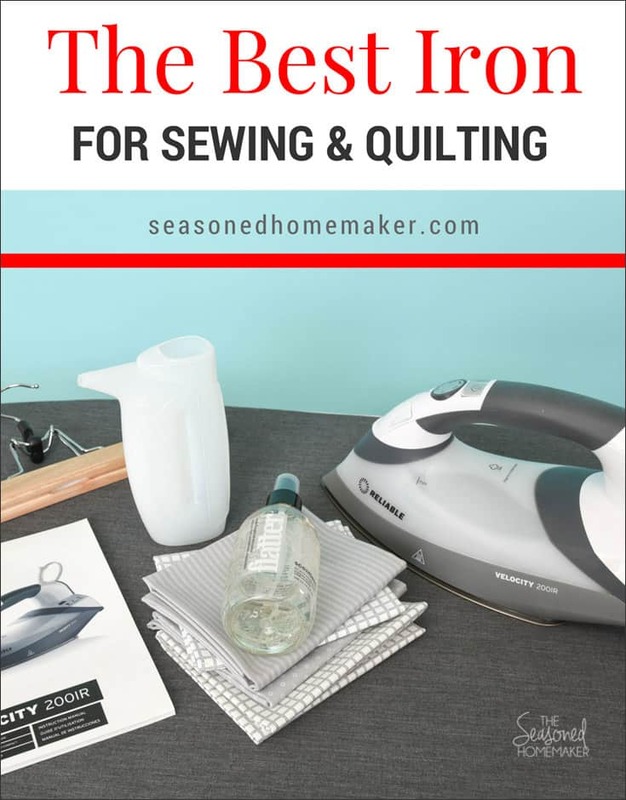 I have always wanted a great iron (I iron everything in addition to being an avid presser-while-sewing lady!). Will have to save my SS pennies for a while before I can invest, but it’s on my wish list at Amazon! Thanks for keeping us up to date on things, making us more informed! Hello there! It must have been fate because I subscribe to tons of blogs, and have very little time to read any of them. But I do scan. I scanned yours and found information about this iron…and I bought it. I am about to embark on a huge project for work, and dreaded the thought of using my old iron which was one of the higher end priced, but has never delivered enough heat for linens and table cloths. So based on your review, I thought I’d give this iron and chance before I go up in price and buy an industrial one. I have used it once on my dinner linen napkins which I have held off ironing because I was thinking I need to set alot of time aside for that. It only took one swipe of the Reliable iron to smooth out those napkins! Now I get to see how it works for my professional work. Love the iron and the new ironing board, but do they make one that doesn’t break toes. I have a few of those. I use to keep my iron in a closet on a high shelf. Thanks for the great review. I’m ordering one today! 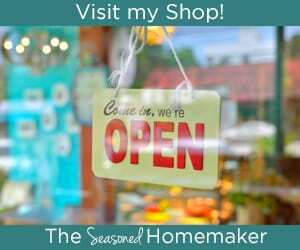 In my sewing room, I have a small lamp by the door that comes on when I turn on my ironing station. If that hard to miss on the way out the door light is on, I know I have forgotten to turn off the iron. Now I can by pass the auto off and the annoying cold iron wait time with my new Reliable 200IR. 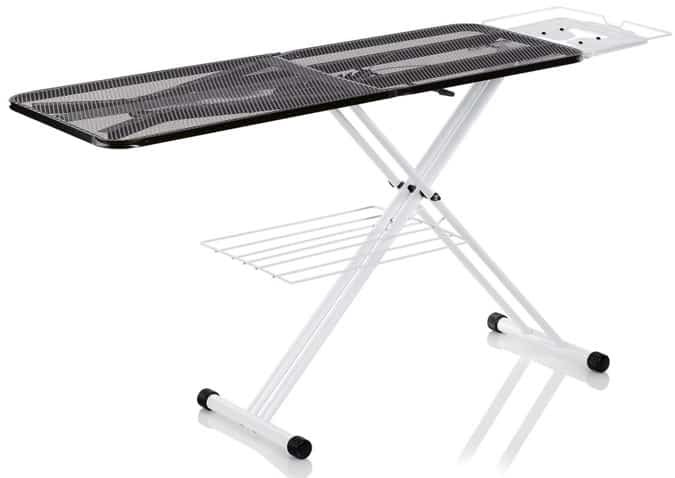 Leslie, I same problem with irons until I purchased my Polder ironing board it has a resting place at the end of the board that is saved my iron many times. Many years ago I purchased a new ironing board because in my garment construction I needed sharp creases and pleats. On several occasions when I was using my Clapper I literally collapsed the ironing board. I would use the clapper and then I would press firmly on my fabric to get the sharp crease I wanted. I collapsed several ironing boards. They just could not take the pressure that I was exerting. That was started making flimsy lightweight irons that just did not perform the way I needed them to in my clothing construction. At about same time I once dropped another iron. So it was also time for new iron and I found my first Rowenta. I loved that iron and at the time it was pretty pricey at a little over $100 in the mid-80s. After buying the expensive iron I certainly didn’t want to ruin it collapsing another ironing board so that’s when I bought my Polder. It was a pretty hefty price at the time between the ironing board I think it was about $85 and an iron of over $100 but it was so well worth it. Of course I have since worn out several Rowenta’s and I’m not as thrilled as I have been with the previous ones. I was really disappointed when they did away with the removable water reservoir which brings up a question. Rowenta says not to use distilled water to just use plain old tap water which is what I’ve always done. 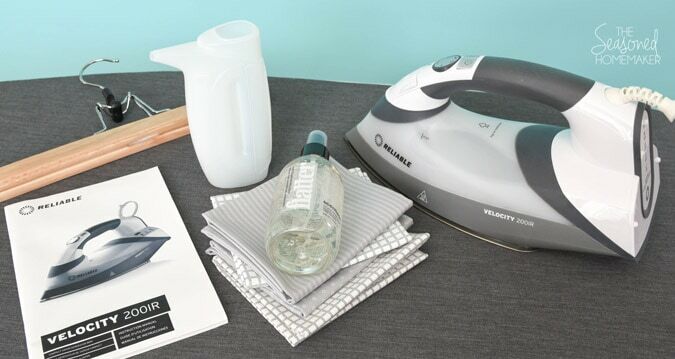 Do you have to use distilled water with this iron that you have dubbed to be the best? I always use distilled water. Sometimes I cut it in half, but my irons last a lot longer with it.